Read up on the design scheme behind the perfect middle-class suburban home. You may be one of the many who believe Dutch houses have gambrel roofs (a variation on the gable roof in which the plane on each side of the ridge is broken roughly halfway down, and the lower half falls steeply to the eave). In fact, some Dutch houses in the colonies did have gambrel roofs, but so did some Basic Houses built by English builders. It was only in the early twentieth century that the gambrel came to be regarded as essential to the Dutch Revival house. To many, the Dutch Revival house is the perfect middle-class suburban home. It’s an efficient design, with two stories of living space neatly packaged into a modified one-story house. It’s more modest than the Georgian Revival house, but the second floor is more spacious than that of the Bungalow or the Cape Cod house. These houses were popular across the country, especially in the years between the two world wars. REMODELER’S NOTES. The roof line of the Dutch Revival house is its single most distinctive design element: If you’re adding on, take pains to respect and perhaps reflect its shape in complimentary fashion. 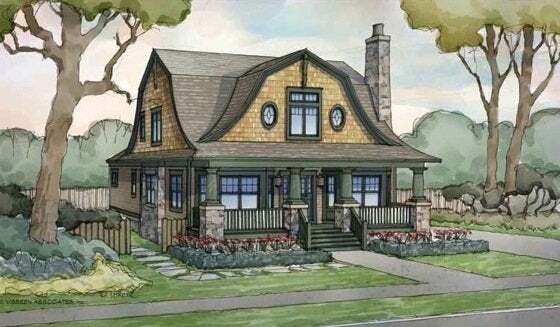 The Dutch Revival architectural rendering below is just one of the many designs available on house plan sites, like e-Plans.